Clifford H. Jennissen, age 77 of Sauk Centre, died after injuries sustained in a farm accident on Tuesday, November 20, 2018 at the St. Cloud Hospital in St. Cloud, Minnesota. A Mass of Christian Burial will be held 11 a.m. Saturday, November 24 at St. Paul's Catholic Church in Sauk Centre with Rev. Greg Paffel officiating. Interment will be held in the parish cemetery with military honors by the Sauk Centre United Veterans Honor Guard. 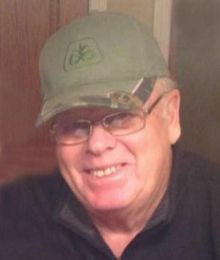 Visitation will be from 4 to 8 p.m. Friday and from 10 to 11 a.m. Saturday at St. Paul's Catholic Church in Sauk Centre. Parish prayers will be held at 7 p.m. Friday evening at the church. Clifford Henry Jennissen was born May 8, 1941 in Villard, Minnesota to Peter and Doris (Schramel) Jennissen. He grew up north of Sauk Centre on the Jennissen farm. At age 16, he joined the U.S. Army National Guard and was honorably discharged on May 31, 1967. Cliff was united in marriage to Janet Arens on April 27, 1963 at St. Paul's Catholic Church in Sauk Centre. The couple rented farm land by Westport and Fairy Lake and was able to purchase their own farm in 1970. Farming was Cliff's passion which he would never give up. He truly loved being home and working on the farm. Cliff was also a Sauk Centre school bus driver for over 30 years. He was a member of St. Paul's Catholic Church in Sauk Centre. Cliff had a passion for John Deere tractors, being a part of Pioneer Days, antiques, attending auctions, and working on the farm. He cherished family gatherings. Survivors include his loving wife of 55 years, Janet Jennissen of Sauk Centre; children, Diane Ironi (Tod Zelmer) of Lincoln, Montana, Deb (Anthony) Vorderbruggen of Avon, Denise (Chip) Kortan of Sauk Centre, Don (Kary) Jennissen of Sauk Centre, and Darcy (Phil) Pfeffer of Grey Eagle; grandchildren, Kayla (William) Counter, Tracy Kortan, Jacob Jennissen, Tory Jennissen, and Ashley (Phil) Brinegar; great-grandson, Logan; step-grandchildren, Tasha Vorderbruggen and James Vorderbruggen; sisters, Vi Wiebolt and Dorothy (Joe) Duevel; and in-laws, Don Koester, Dorothy Jennissen, Marlene Jennissen, Cheryl Jennissen. and Denise Jennissen. Cliff was preceded in death by his parents; brothers, Francis, Peter, and Raymond Jennissen; sisters, LaVerne Bokinski and Elaine Koester; and brothers-in-law, Eugene Bokinski and Willie Wiebolt. In lieu of flowers, memorials are preferred to Holy Family School.